You couldn't make it up! I sometimes think Eastenders is far-fetched! Albert was appointed bishop, elevated to cardinal, ordained deacon, ordained priest, ordained bishop and assassinated, all in the space of 1 year! What a year! However, he wasn't content with these ecclesiastical positions, he was also a canon and an archdeacon. Son of Duke Godfrey III of Brabant he was made a canon of Liege, at age 12. However, this was a political appointment for guaranteed income rather than a religious vocation. He gave up the position at age 21 to become a knight and eventually realized that religious life was calling him. He became a canon of Liege again, this time as a true vocation. 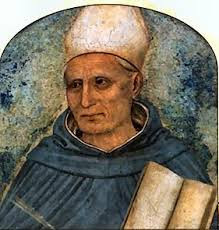 He became archdeacon and provost of Brabant and later, Bishop of Liege in 1191. However, others had an eye on the top job and he was ousted. Albert didn't give up easily and the pope reinstated him but the new incumbent refused to give up the position and they had trouble finding a bishop to ordain Albert. He was persistent and eventually regained the position of bishop and was duly assassinated.